These are not rare as a type. Some are only worth a few hundred dollars. You really just need to pay attention to the bank of issue and condition. Some examples can be worth thousands of dollars. 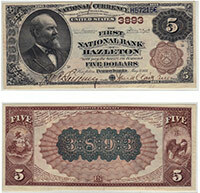 It is also interesting to note that James Garfield was the first person to be featured prominently on a national bank note. Each state also has a unique seal on the back left hand side of each note. Some collectors try to collect a seal from each state. Don't forget to check the serial number. Number 1 notes always sell for nice premiums.